Fire extinguishers seals are plastic loops that are used to secure fire extinguishers. The seals are tamper evident so it’s easy to tell at a glance if the seal has been compromised, either through use or vandalism. Fire extinguisher seals thread through the trigger of the fire extinguisher, but must be weak enough to be easily broken off in the event that the fire extinguisher is needed. SupplyPlaza is a provider of all manner of security seals including tamper evident fire extinguisher seals that include a large label flap on which the last fire extinguisher checkup can be marked. 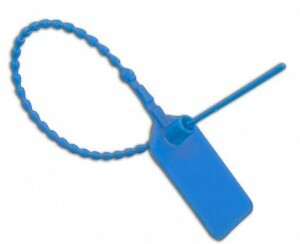 Fire extinguisher seals are made from easily breakable plastic and come in a variety of colors. SupplyPlaza has all security seals in stock and available in small quantities as well as bulk, and offers same day shipping on all fire extinguisher seals. Most companies require basic fire safety policies, including regular and prominent placement of fire extinguishers throughout the premisis. Fire extinguishers must be checked at least annually to verify that the charge is still good. Unfortunately, even a recently checked fire extinguisher can fail in an emergency without the use of fire extinguisher seals. The primary advantage of the seals is to provide evidence if the trigger of the fire extinguisher has been pulled. This is particularly important in schools and other facilities in which vandalism is a danger. It’s possible for someone to grab a fire extinguisher, pull the pin, and set it off outside. The pin can then be replaced and the fire extinguisher returned exhausted, unfit to perform in actual fire emergencies. The fire extinguisher seals have a small beaded plastic loop that feeds through the trigger area of a fire extinguisher. It’s not possible to discharge the fire extinguisher without breaking the loop — the seal itself does not prevent the fire extinguisher from being discharged (which could prevent a hazard in the event of a real emergency) but instead simply makes it obvious if the fire extinguisher has been used. The beaded design of the fire extinguisher seal strap is specifically engineered to be very easy to break, typically with an average break strength of just 13.5 pounds — suitable for even younger users. The industry standard fire extinguisher seal is the Pull-Tite seal, which includes a larger flat labeling flap at the end of a beaded cable for labeling purposes. One use of this label surface is to include the date the seal was affixed, so it’s obvious how long the fire extinguisher has been left unused.